We have a fully working saddlery here at the Farm, we make all our saddles and harnesses right here from scratch. It takes about 30 hours to make one complete saddle. Saddles weigh18kg and can hold 2 people. Repairs and maintains on saddles bags, harnesses and saddles all take place in the saddlery. Chris is our saddle maker and leather work expert, the equipment used in the saddlery is from Chris’s own personal collection of rear antique saddlers tools, these tools are all still used by Chris today. The Royal Mail Hotel features a bar area, full outback kitchen with fridge, gas oven and cook top, 2 flat top BBQ’s, stainless steel prep benches along with moveable bench space so the kitchen lay out can be changed to suit different functions. There is also a fire pit completing a relaxed outback feel. The area also features views of Uluru. All timber and iron work is recycled. The construction was completed outside work hours with many UCT staff joining in the up/recycling project. The “Staging Post” area is located next to the Saddley – This exterior look of this extension portrays a building from the ‘wild west 1880’s’ complete with rustic signage. The staging post houses a fully restored Cobb and Co stagecoach, 12 seater wagon and 3 seater buggy, this area also contains a history display made up of images and artifacts. The bar with the ‘best view’ in the NT. 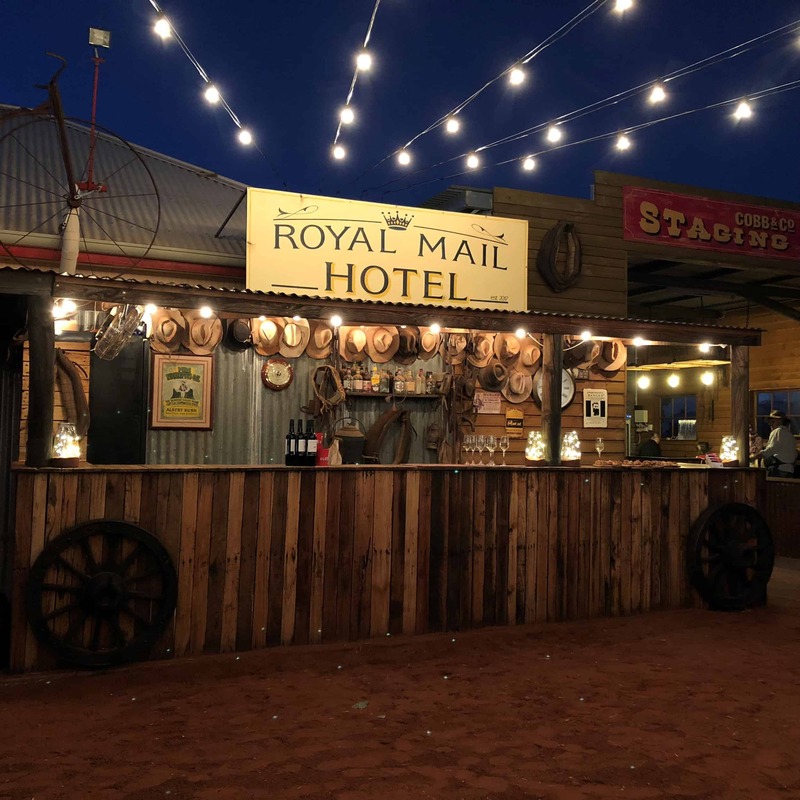 This rustic and quirky outdoor bar comes alive for corporate functions regularly held at the farm and on Uluru Camel Cup race day is a hive of activity. 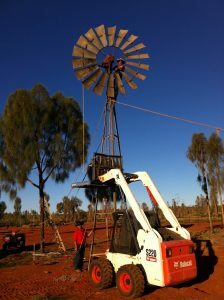 Our Windmill was proudly donated to us by Curtin Springs Station. The Windmill was the original homestead windmill that supplied the Curtin Springs homestead for over 40 years before being replaced with a modern electric water pump. March 2013 a team of strong blokes from the farm salvaged the old windmill from Curtin Springs. On it’s arrival at the farm the head of the windmill was fully rebuilt once the rebuild was complete the windmill was erected in one piece and now stands proudly in the center of the farm. 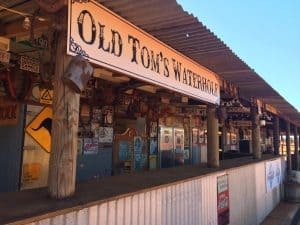 Browse our gift shop where you will find a unique range of Camel souvenirs, delicious bush trucker condiments, outback books, and photography. Learn more about this quirky and fun weekend here. You can use our fully equipped BBQ and picnic area complete with relaxing views of our farm and desert landscape. Picnic seating for 100. Uluru Camel Tours was founded in 1998 by NT tourism pioneers, Nick and Michelle Smail. After operating at the rock successfully for seven years, they then sold the company to Wana Ungkunytja , an Aboriginal-owned corporation, in July 2005. Wana Ungkunytja operated the farm for six years, however being corporation-owned and managed from Alice Springs some 460km to the north things did not work in the farm’s favour and it became difficult to sustain the business due to a lack of camel expertise. March 1st 2011 the business changed hands. The new owners quickly breathed life back into the farm with the number 1 priority rejuvenating the 12 camels that came with the farm. Many long hours of hard work were spent get the farm ready for visitors. Chris brought to the operation 12 full trained working camels, a life time of camel experience, and great deal of passion and enthusiasm. 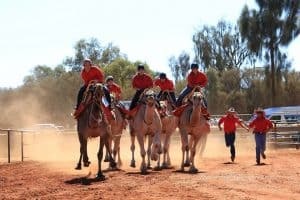 The business has grown from a small operation in 2011, conducting three tours per day, to the largest working camel farm in Australia operating five tours per day. 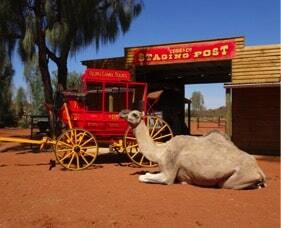 It is now home to 60 working camels from the wilds of Australia, the majority caught and trained by Chris. For those that are not booked on one of our tours, we welcome visitors to our farm daily between 9am and 3pm in the cooler months (April to October) and 9am to 1pm in summer (November to March). We are actually based at the resort, approximately five minutes’ drive from all the hotels. Or you can also catch the FREE resort shuttle bus. Coach and big rig parking available.